Custom bikes, bringing the world together one build at a time. Who would think that building a beautiful motorcycle would be of such a benefit to multiculturalism? 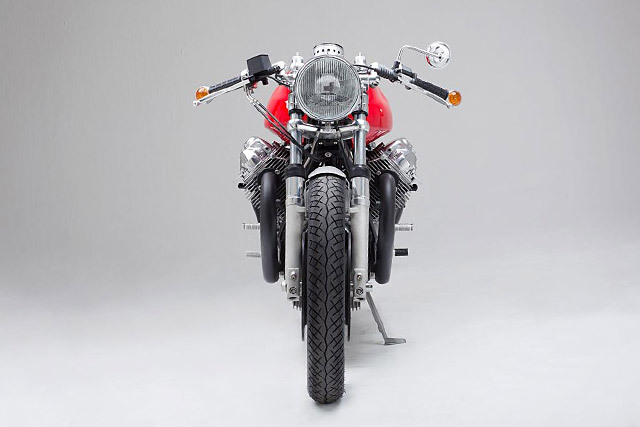 Today’s feature bike is an Italian machine, modified in the style of the British, built by a German company for an American. 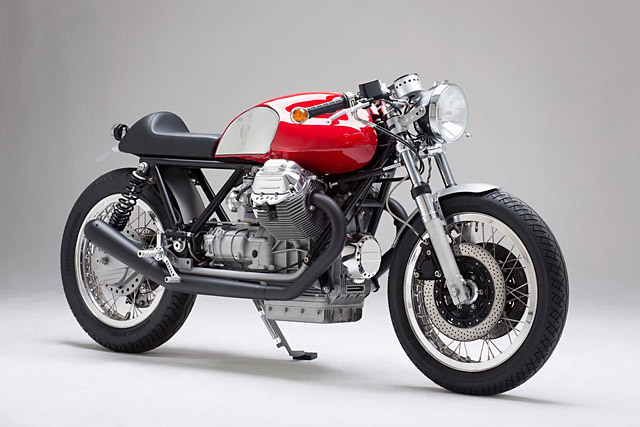 With so many nationalities putting a bit into this bike, this Moto Guzzi Le Mans 3 went through a Hamburger maker to produce the smooth racer you see here today. 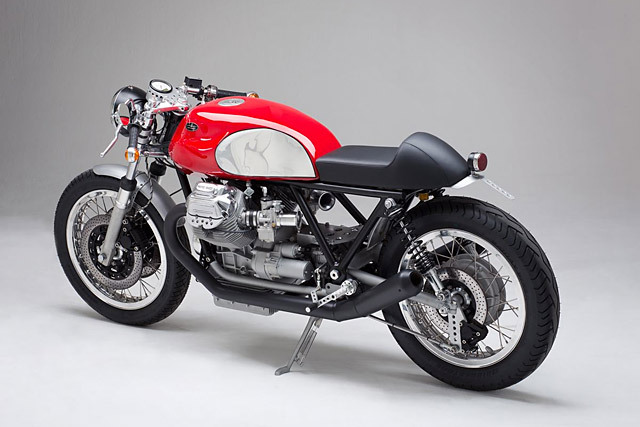 In true Kaffee Maschine style, the workshop has come up with a bike featuring dynamic lines and a strong sporting stance – it’s just the sort of thing you could ride into a UN meeting. The brief for the build was to produce a style that wouldn’t look out of place in the 60s, with modifications that are more current age. ‘Some muscles’ were also asked to be added to the bike during the process. The transmission and rear drive were assessed and modified accordingly, then it was time to work the engine. The engine was stripped down and fully rebuilt, with the original capacity being blown out to 1040cc using bigger pistons and cylinders. The crank was balanced, and a lightweight flywheel fitted. 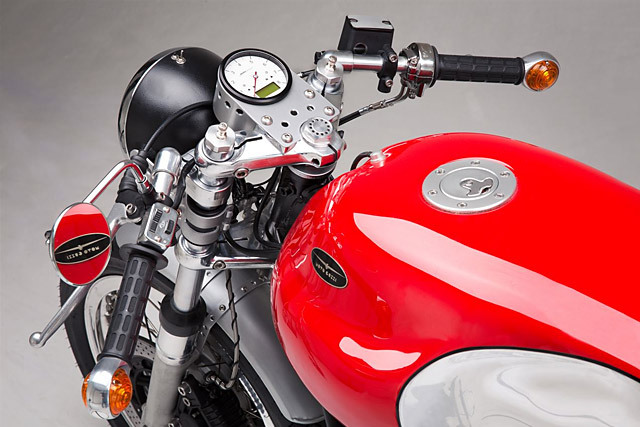 Dual spark heads were utilised in the build, along with a cam with a more sporting profile and valves to suit. Finally, electronic ignition was wired up, and a new set of modified carburettors mounted. In relation to looks, this is where Kaffee Maschine’s work really stands out. The frame has been cut down and modified, with the factory airbox being ditched allowing for a more dietary conscious look for the bike. The fuel tank is a handmade WBO replica, finished in a paintjob so deep it looks like you could dive into it. That alluring seat is a genuine Kaffee Maschine fibreglass hump, trimmed in genuine leather. Dotted all over the bike are various Kaffee Maschine alloy parts, produced especially for this build. With all the extra muscle built into the 90 degree V twin, the brakes on the Italian machine needed some beefing up as well. New brake cylinders were sourced, and mounted along with stainless hoses. To help with the bike’s roadholding ability, the suspension has been touched up to suit. The forks have been overhauled, and fitted with FAC dampers. The rear of the bike now sports KM Ikon shock absorbers, along with a KM torque support unit. 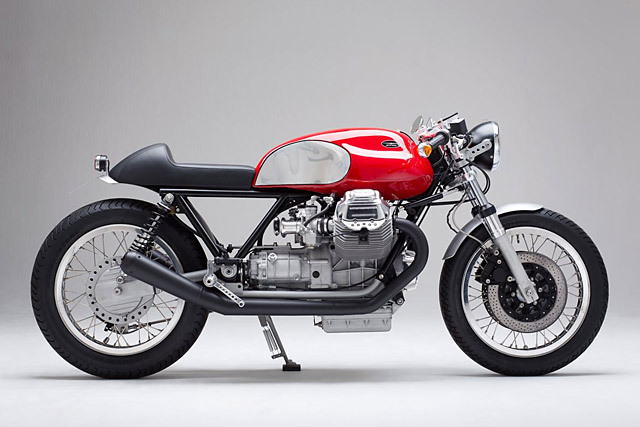 Affected by a whole world of influences, Axel from Kaffee Maschine has again produced another stunning Guzzi café racer. 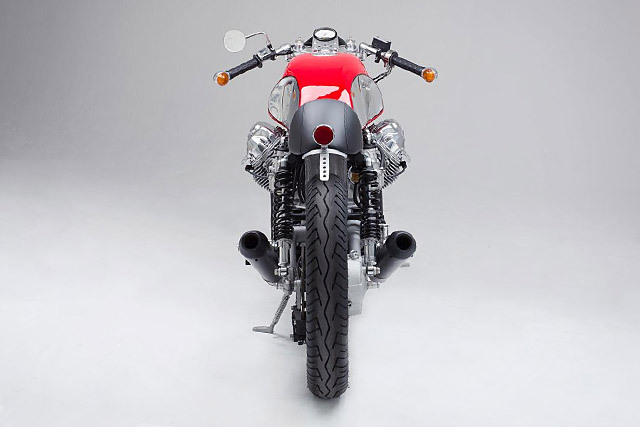 An ocean-deep paint job, reduction in superfluous componentry and an awesome sense of taste has made this motorcycle what it is today. Multiculturalism, don’t you just love it?